Evidence for the survival of sub-Roman territories in the Midlands is extremely thin, as this area was quickly overrun by Angles in the late fifth century. But to the south and west the Britons clung on doggedly into the seventh century. Cynwidion, traditionally centred on Northampton (in modern Northamptonshire) and Dunstable (Roman Durocobrivae, modern Bedfordshire, just northwest of Luton), and certainly south of Powys, was one such kingdom. Its borders, of course, are unknown, and although the background to its creation is based on oral evidence not written down until the ninth century at the earliest, there is archaeological evidence to back up the story. The youngest son of King Arthwys of the Pennines, Cynfelyn, moved south along with his own son soon after the date most usually ascribed to the death of Arthur, presumed High King of Britain. As Arthur was probably the last High King to be able claim all of Britain as his domain, a power vacuum probably emerged in the early sixth century during which late Celtic kingdoms could be founded in land previously protected by whatever sub-Roman imperial power had survived. Cynfelyn found willing followers in the Chiltern Hills where he set up the kingdom. His son altered the name to reflect the kingdom's location, Calchwynedd (Chalk-Hills), and the evidence suggests that despite Anglian pressure to the near east, there was a Celtic presence in the area until well into the seventh century. Undated earthworks were thrown up probably for this reason. The Iclingas who eventually formed Mercia and many other groups of Middil Engle (Middle Angles) were already entering the Midlands by the time of the kingdom's founding, and it seems they forced their way south from the territory of Caer Lerion in the Leicester region. One can imagine the kingdom slowly shrinking in the face of Middle Angle advances from the east and north, eventually losing Dunstable and becoming bottled up in the Chilterns until the end came and the kingdom collapsed some time in the early 600s, either before or relatively soon after Elmet not far to the north. 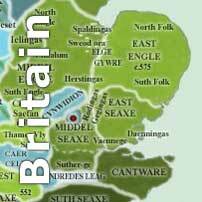 The region had already been partially settled in the west by the Ciltern Saetan (Chiltern Saxons). Some of the kingdoms that adjoined Cynwidion seem highly likely, given the evidence, to have been based on old Roman cities and Roman cantrefi (the equivalent of modern boroughs). Caer Luit Coet (Roman Letocetum, modern Wall in southern Staffordshire) was the place to which the kings of Glastenning (the Dumnonian sub-kingdom in Somerset) fled. It was also the capital of the eastern half of the Kingdom of Pengwern, which apparently consisted of three sub-kingdoms, governed directly or indirectly by the over-king himself (there is little evidence to suggest the territory fragmenting in the seventh century, so its central authority must have retained overall control). 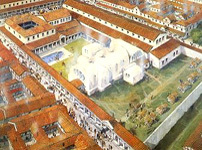 It is likely that Pengwern had been divided between sons in the Celtic tradition, becoming sub-kingdoms based perhaps at Caer Guricon (Roman Viroconium, modern Wroxeter just east of Shrewsbury in Shropshire), Caer Magnis (now Kenchester, just west of Hereford in Herefordshire), and Caer Luit Coyt. Caer Guricon has provided the most extensive archaeological evidence for the survival of the Roman way of life during the fifth to sixth centuries in Midlands Britain. Nothing is known about the formation of this kingdom, but by 613, the King of Pengwern was Cyndrwyn Fawr (the Great, although his other nickname was the Stubborn). Constantine probably ruled in Caer Magnis (and was probably a younger brother), and a second brother, Morfael ap Glast, was king of Glastenning and gained Caer Luit Coyt in eastern Pengwern. Cyndrwyn Fawr fought in battle against King Æthelfirth of Bernicia at the Battle of Caer Legion (Chester, in Cheshire) in 613 alongside the kings of Gwynedd, Powys and Dumnonia. It seems he survived the fight to die around 620. The kingdom passed to his son, Cynddylan, who ruled for around thirty-six years before the kingdom fell in 656. Cynddylan's capital, Llys Pengwern, is traditionally said to have been the Saxon foundation of Shrewsbury, but was more likely the Berth at Baschurch, just to the north. There are indications that there was also an outpost at Din Guricon, the hill fort on the Wrekin that overlooks Caer Guricon, but such were the incursions of the Iclinga Angles to the east, and various Saxon groups to the south, that a more defendable site than the old Roman town was required by this time. Cynddylan's exploits are remembered in the Marwnad Cynddylan and the Canu Heledd (a cycle of poems named after Cynddylan's sister, and originally attributed to King Llywarch Hen of South Rheged, erroneously as it turned out - none of the work of this poet-king has survived). They tell Heledd's lament at the destruction of the Kingdom of Pengwern, and of Cynddylan and his family. Cynddylan had been far from idle during his reign, and had made a strong alliance with Penda of the Mercians. They had fought together against the invading Northumbrians, particularly at the Battle of Maes Cogwy (Oswestry, Shropshire) in 642. 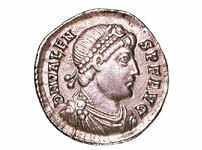 Here they were successful, killing their northern enemy, King Oswald. This appears to have brought Pengwern fourteen years of comparative peace, but in 656, after Penda's death, Oswald's brother, Oswiu, found his way clear to wreak revenge on Cynddylan. He overran Llys Pengwern, and the Pengwernian king was brutally hacked down along with several of his brothers. He was buried at Eglwysseu Bassa (Baschurch, Shropshire) and the Royal Court dispersed (perhaps returning to the land of its cousins in Gwynedd). With the territory now undefended and largely in the hands of Oswiu while he was overlord of the Mercians, western Pengwern was settled by Saxon groups moving up from the territory of the West Saxons and the Hwicce. They made the most of the sudden power gap to found small kingdoms based on Caer Guricon (the modern name Wroxter has evolved from the Saxon Wrocenset, which itself is a rendering of the Roman Viroconium) and Caer Magnis (the Magonset Saxons also derived their name from the former Romano-British name). By the beginning of the eighth century, the Anglian Mercians had gained overall control of the region. Text copyright © P L Kessler, from various notes and sources. An original feature for the History Files.